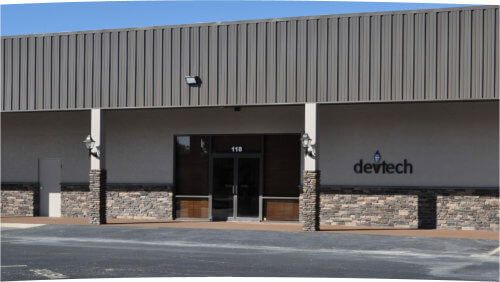 From the North: travel South on US Hwy 27 to Avon Park, turn left or East onto Main St. (also S. Hwy 17), proceed 2/3 mile to Lake Ave, turn right or South, Devtech is the 4th building on the right. From the South: travel North on US Hwy 27 to Avon Park, turn right or East onto Main St. (also S. Hwy 17) proceed 2/3 mile to Lake Ave, turn right or South, Devtech is the 4th building on the right. From the West: travel East on State Rd. 64 to Avon Park, go past US Hwy 27 and it will become Main St (stay heading East) proceed 2/3 mile to Lake Ave, turn right or South, Devtech is the 4th building on the right.